Al-Qaeda affiliate claimed responsibility for Iranian cultural center bombing in Lebanon, but Iranian foreign ministry blames Jewish state. A known terrorist group has claimed responsibility for Wednesday's bombing in Beirut. The blast, which occurred just outside the Iranian cultural center in Lebanon's capital, killed four and injured at least 100. Al-Jazeera America report that the known terrorist group the Abdullah Azzam Brigades, an al-Qaeda affiliate, has already claimed responsibility. "We will continue - through the grace of God and his strength - to target Iran and its party in Lebanon (Hezbollah) in all of their security, political and military centers to achieve our two demands," the statement said. But the Iranian Foreign Ministry claimed the real culprit was Israel. "There is no doubt that those responsible for this terrorist operation are resisting the stability, security and unity of Lebanon," Iranian Foreign Ministry spokesperson Ma'ariza Afkaam stated to state news agency IRNA. "They are agents of the Zionist regime, who are frustrated at the fact that Lebanon's new government includes members from all political parties." This, despite the fact that the group has expressed its intent to attack Israel as well as Iranian-linked targets. IRNA reported earlier that Wednesday's explosions occurred very close to its offices in Beirut, which include the Iranian cultural attaché offices and state television network IRIB. Other landmarks nearby are the Kuwaiti Embassy in Lebanon, a military camp of the Lebanese army, and an orphanage of run by an Islamic association. Abdullah Azzam: a terror group out for revenge? The Abdullah Azzam Brigades has a long history of targeting Hezbollah, the Iranian-backed Shia group which has drawn anger among Sunni Muslims for aiding the Syrian regime of Bashar al-Assad against the mainly Sunni rebels fighting to oust him. The group's most high-profile attack came late last year, as it claimed responsibility for the November 19, 2013 bombing of the Iranian embassy in Beirut. 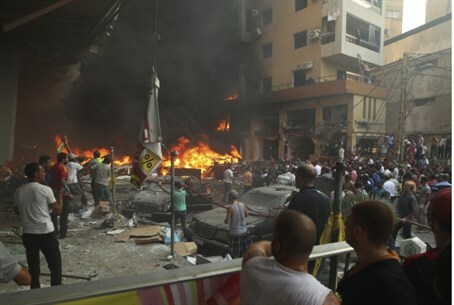 The blast ripped through the embassy, located in a Hezbollah stronghold of the capital, killing 23 people and wounding 146. Attacks stepped up again this week despite Lebanese officials arresting his replacement, Naim Abbas. Abbas led authorities to car bombs which had already been placed for another potential attack. "Immediately after interrogation began, he [Abbas] confessed that he had prepared a car bomb to be set off later and that the car was left in Corniche Mazraa," the Lebanese Army said. The confession led soldiers to a parking lot there; the Army added that the bomb, weighing 100 kilograms (220 pounds), was safely disabled. Explosives belts and several rockets were also removed from the vehicle. "This is a big catch given the role Abbas played in terrorist acts and the recent wave of car bombings across the country, particularly in Beirut’s southern suburbs and the northeastern town of Hermel," a high-ranking security source told the Daily Star.